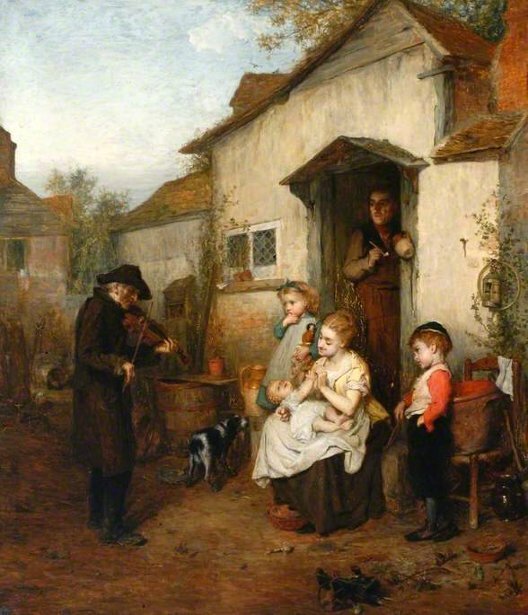 Here is a painting by the Scottish artist John Burr (1831-1893) of an itinerant fiddler playing for a family in a Scottish lane probably trying to make enough money to eat or maybe even receive some food for his entertainment. I can’t help but think the father looking out has a skeptical look; possibly wondering what this will cost in the end. Music and storytelling were a very different commodity in an age of widespread illiteracy and 24 hour media. It’s hard to even imagine a time when all music was handmade and intimate and not an item to be mass marketed.